We want to let our premier customers know about our exciting new adventure for the 2017 season. We are now offering a limited number of spots on an overnight boat-based bear viewing trip. 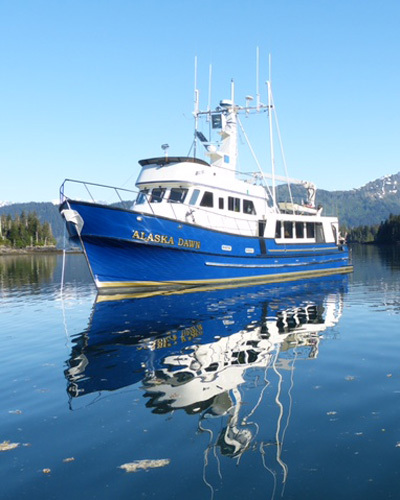 This adventure will be based from a beautiful 65′ boat, the “Alaska Dawn” owned by Captain Paul Brand. 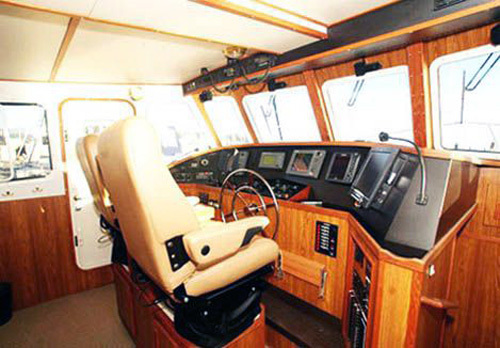 Captain Paul has the extensive experience in Alaskan waters needed to keep you safe. When you transition to land, Michael Hughes, the owner of K Bay Air & Alaska Bear Adventures will share his passion and knowledge of the coastal brown bears and their habitat with you as your bear guide. The trip will start on Sunday night with a stay at Lands End Resort in Homer, Alaska where you can enjoy a lovely dinner and lodging at the end of the famous Homer Spit. On Monday you will take an hour long flight to the Katmai Coast to meet up with the Captain and Crew of the Alaska Dawn (time dependent on weather and tides). You will then have six days of bear viewing, spending your evenings on the boat, Monday through Saturday night. You’ll fly back to Homer on Sunday, and stay an additional night at Land’s End before your start your next great Alaskan adventure. This is an all inclusive trip and covers: all meals while on the boat, $100 meal voucher for your first night at Land’s End, lodging for eight nights (six nights on the boat, two nights at Land’s End), six days of guided bear and wilderness tours, and flight-seeing to and from the boat (weather permitting). The cost of this trip is $8950 per person for the full 8 day itinerary. For the 2018 season this trip will start on June 17th. Dates and times may vary based on Alaska weather. For answers to your questions and more information about this amazing adventure call Dee at 877 522-9247. The Alaska Dawn is a sixty five foot expedition trawler. 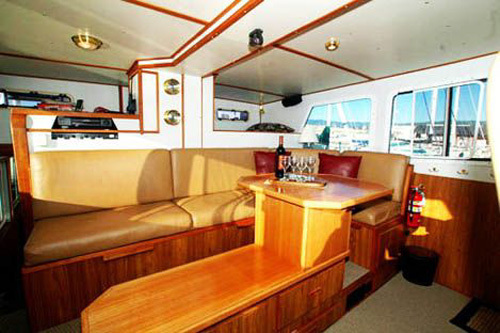 This vessel can safely facilitates small group adventures into remote areas of Alaska. On the back deck there is a hydraulic davit with a pot puller set up to retrieve shrimp and crab pots. A large swim step off the stern makes loading passengers on and off the skiff very easy. Riding on the upper deck is a skiff that is launched with a hydraulic crane. The skiff is used to access the beaches, rivers and back bays where the Alaskan Dawn cannot go. All of the propulsion, navigation and safety equipment is very well maintained and upgraded to keep us safe during our alaskan wilderness adventure. Safety gear includes a top of the line fire extinguishing system and navigation electronics, an EPIRB, satellite phone, life jackets , flares, survival suits and a survival raft. The vessel carries 900 gallons of water and has a desalination system to replenish fresh water. 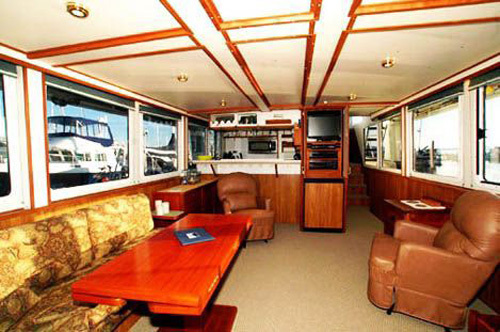 The wheelhouse on the Alaska Dawn offers a luxurious leather seating area, leather Knoedlen helm chairs and beautiful wooden table. The living area, heated by a oil-fired stove, is spacious and warm. It is a comfortably inviting area with sweeping panoramic views for guests to enjoy. Schedule An Alaska Bear Watching Tour Today! 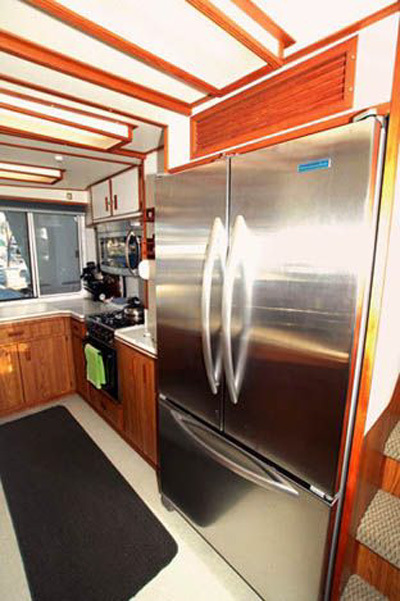 The galley is fully equipped with all the modern appliances necessary for the preparation of healthy and delicious meals. 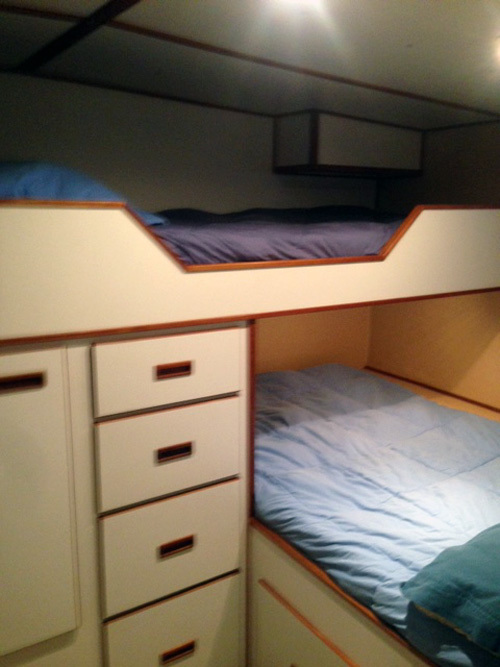 Alaska Dawn has three private staterooms with their own heads and showers. 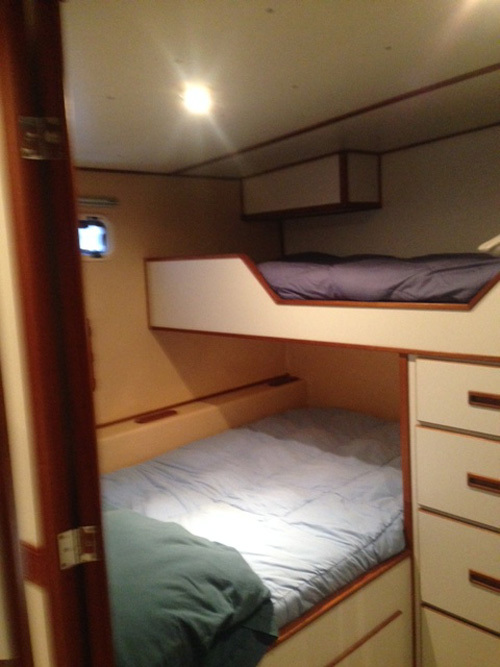 Two of the staterooms have a double bed and a single bed. The forward room has two single beds and its own bath.